ORLANDO – The Surf Expo has expanded in diversity over the 37 years of its existence, and has ultimately become a global watersports and beach lifestyle trade show that is a world unto its own. More than 2,000 vendors, multiple business-savvy seminars, skateboard exhibitions, surfboard shaping competitions and eye catching fashion shows encompass this all things outdoor and action sports paradise that took over the Orange County Convention Center from Jan. 10 through 12. “You just gotta love all this expo has to offer there really is something for everyone, I try to make it out every year,” said convention attendee, Jason Rogers. Summing up the mission of Surf Expo was a surfboard shaping contest called the “Florida Shape Off,” which works to promote handmade surfboards in America. “Well a lot of people like the artwork of 'The Walking Dead,' and this is just something to demonstrate what we are capable of at our factory,” said Josh Dirocco, who has been working exclusively for the past eight years as a painter for R&D Surf based out of Cocoa Beach. Another attraction was a large indoor skateboard park that hosted several competitions and allowed everyone from veteran riders to the youngest of skaters to experience the thrill of riding on a obstacle filled street course and half pipe ramps. The Surf Expo fashion show used several models to display the latest casual and beach wear outfits and accessories from dozens of designers. Some of the featured styles included tropical print bikinis, Stars and Stripes brand cut off jeans, a multi-colored tie-dye maxi dress and a strapless cobalt jumpsuit. Featured at Surf Expo alongside big name companies were hundreds of small businesses and startups, all hoping to impress retailers with their wares. One such company was Polar Basics based out of Jacksonville. They were marketing a range of products designed with polyvinyl alcohol integration, which gets substantially cold when wet. “Our most popular product is a cooling towel that activates when you add water and will stay 65 degrees for two and a half to three hours,” said spokesmodel, Courtney Vaughn. The next Surf Expo will take place in September, and more information on this event and all the retailers can be found on their website at www.surfexpo.com. 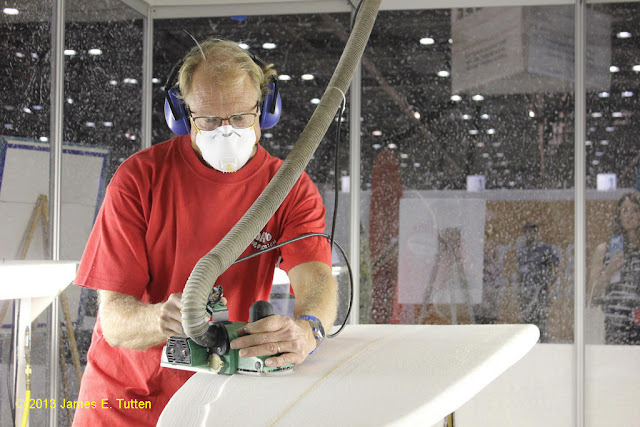 Shaper, Scott Busbey, focused on his work during the Florida Shape Off contest at the 2013 Surf Expo in Orlando. 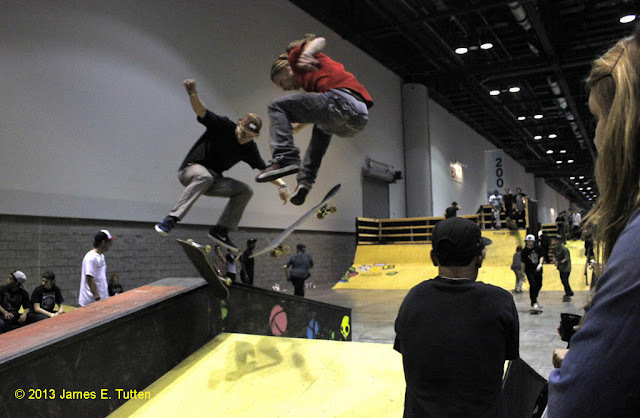 Skateboard competition in full swing during the 2013 Surf Expo in Orlando at the Orange County Convention Center. The Walking Dead artwork painted by Josh Dirocco on recently shaped surfboard at the 2013 Surf Expo in Orlando.